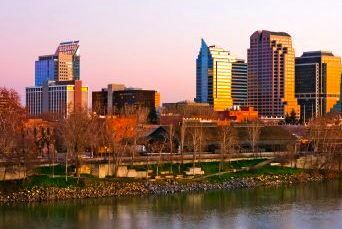 Situated at the confluence of the Sacramento River and the American River, the Sacramento area is a true gem of Northern California. Active adult communities in the Sacramento area are located less than two hours northeast of San Francisco and west of the Eldorado National Forest. 55+ communities in the Sacramento area are perfect for residents looking for convenient recreational attractions with an urban experience. Active adult communities in the Sacramento area are in California's fourth largest city and are in close proximity to many cultural opportunities and miles of beaches along the Pacific Coast and Lake Tahoe. Active adult communities in the Sacramento area boast a Mediterranean climate with hot, dry summers and mild winters. October through April is the city s wet season while light rainfall can occur in June or September. Snow is very rare in this part of Northern California, although Sacramento area residents may see an occasional flurry or light dusting. Snow does accumulate in the foothills and mountains to the east, including the famous ski resorts at nearby Lake Tahoe. Temperatures in age-restricted communities in Sacramento range from the mid 40s in the winter to the mid 70s in July. Although age-targeted communities in Sacramento can experience days into the 100s, these are often tempered by a sea breeze. The Sacramento metropolitan area is 100 square miles, a vast majority of which is land. West of Sacramento is home to a flood control basin, meaning that Sacramento s metropolitan area expands mostly to the northeast and east into the Sierra Nevada foothills and to the south. With a beautiful climate, it's no surprise that outdoor activities are popular with active adults and retirees in the Sacramento area. Parks, sporting fields and nature preserves offer a wide range of outdoor activities including hiking, biking, kayaking, boating and wildlife observation. Some of the more popular parks include Capitol Park, McKinley Park and the immense William Land Park that has a zoo, two golf courses and picnic areas. Active adults in the Sacramento area will delight in the selection of golf courses. Many beautiful and challenging courses can be found throughout the Sacramento area. A few well-known public courses include the Empire Ranch, Teal Bend and Turkey Creek Golf Clubs. Golfers might also want to try the city's beautiful 18-hole championship Bartley W. Cavanaugh Golf Course. Active adult communities in the Sacramento area have plenty of cultural offerings at their fingertips, including a variety of performing arts centers and art museums. A few notable companies include B Street Theatre, the Sacramento Opera, the Sacramento Theatre Company, Crest Theatre and The Cosmopolitan Cabaret. History buffs will love Old Sacramento, the Gold Rush-era buildings and museums, as well as contemporary boutique shops and a charming boardwalk along the Sacramento River. In addition to Old Sacramento, visitors can explore a variety of distinctive shopping and dining centers throughout the city. Local retail is sold through a variety of venues, including specialty shops, department stores and shopping malls such as the Arden Fair Mall or Westfield Downtown Plaza. Bargain shoppers can hunt for great deals at both Folsom Premium Outlets and Vacaville Premium Outlets. Age-targeted communities in the Sacramento area have a cost of living higher than the rest of the country. On average, residents of Sacramento 55+ communities can expect to spend more on groceries, healthcare and utilities. Although Sacramento is more expensive than the United States on average, it is approximately 14 percent less expensive than the rest of California. The sales tax in Sacramento is 8.25 percent. There are six state income tax brackets that range from 1 to 9.3 percent. Property taxes range from 1 to 1.3 percent and social security benefits are taxed although pensions are exempt. Active adults in the Sacramento area benefit from having 20 hospitals in the metropolitan area. Sacramento 55+ communities are close to five high-performing hospitals, including Kaiser Permanente Sacramento Medical Center, Sutter Roseville Medical Center, Kaiser Permanente South Sacramento Medical Center, and Sutter Medical Center. The University of California, Davis Medical Center is ranked as one of the best hospitals in the state. They are nationally ranked in the fields of cancer, nephrology, pulmonology, urology, and neurology.